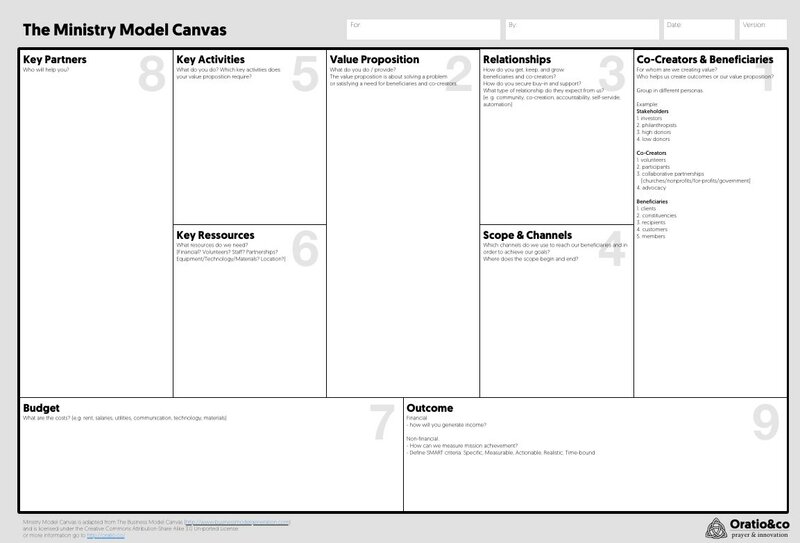 The ministry model canvas is a great tool to help ministries ideate and validate new ministry initiatives or reinvent existing ones. The canvas helps you capture the essential building blocks of a ministry and then serves as a foundation for further discussion of models, approaches and underlying hypotheses which can be explored and validated and then help refine and adjust the ministry model. This will ensure that an effective model will be reached within a minimal period of time and without unnecessary friction and burnout due to ineffective implementation models. For best results gather the team that will be part of the initiative as well as some people with understanding in the topic for support and insight. This could be a church leadership team, or an outreach team or the kids ministry staff for example. Print out the canvas on a large sheet and provide pens and sticky notes. If there are multiple initiatives or if you want to explore and generate different approaches to the same target audience, you can split into groups and fill out multiple canvasses at the same time. Set an overall time limit for the canvas activity to 90 minutes. For more information, please get in touch at toby@oratio.co or book a call.